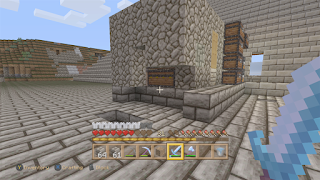 Hello and welcome to Episode 18 of my Let's Play Minecraft on Xbox series. I haven't played Minecraft in a few weeks so I decided to put some free time I had into it and the next thing I know I've spent a considerable amount of time working at the "Great Pyramid" complex. 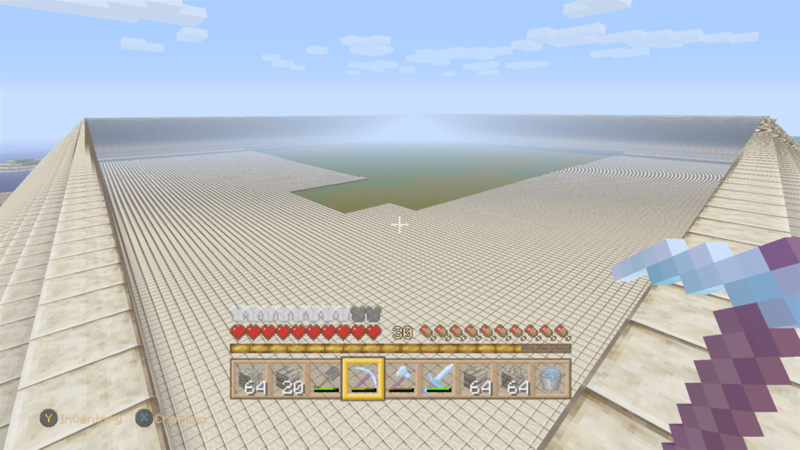 Each block I mine, shovel, or punch gets me one step closer to completion. If you want to catch up with Episode 17 you can click here. 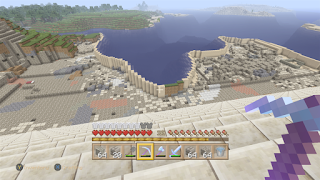 Here is a shot of what the area looks like from the front of the pyramid. 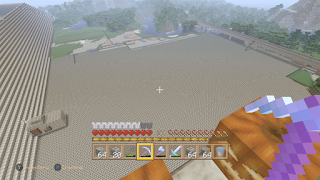 I still need to continue mining and flattening this side of the pyramid but I've put it on hold for a bit. 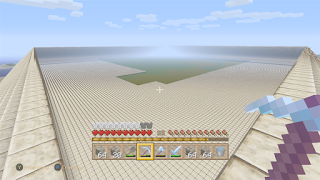 In order to finish the floor of the pyramid, which will then allow me to finish construction the pyramid itself, I need to mine lots of sand and sandstone which this side doesn't have too much of. Because of this, I've moved to the left side of the pyramid which has both in abundance. This is a shot from the top of the pyramid of the left side. You can see that I've been hard at work mining this side. Each layer that I remove has less and less sand and sandstone in it so I'm almost finished on this side. Even with the amount of blocks I've mined on this project, I'm not even close to finishing which is making me feel like quitting for something easier but I push on through and continue working. Once the pyramid itself is completed I will be building an Egyptian complex around it so this hill you can see beside the pyramid will need to be leveled. Originally it contained a bunch of sand but I've stripped it down to the dirt and stone and it will stay at this level until I need more dirt which surprisingly will probably be needed sooner than later. 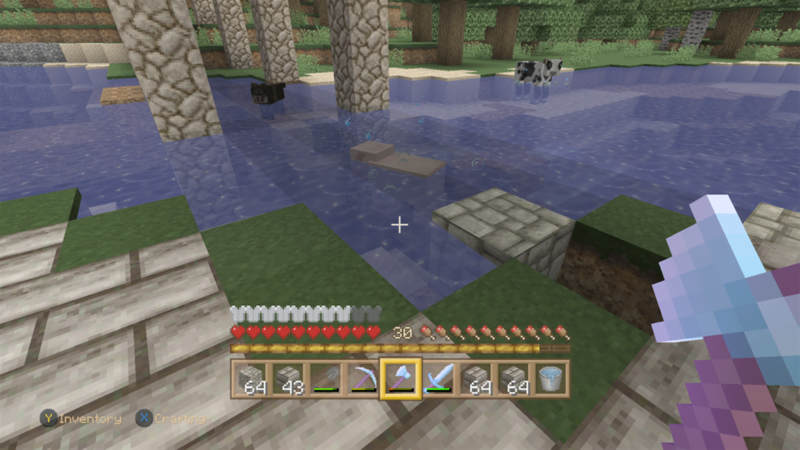 On my way back to my hut at sundown, I was ambushed by a Creeper and couldn't get back far enough from him before he blew himself up and this is the damage he caused. 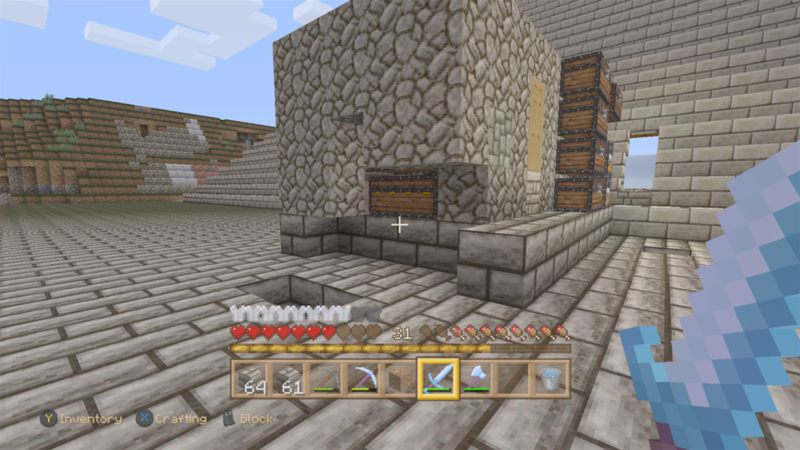 One of the reasons I like to build out of stone is that it can take a decent explosion with minimal damage. I was undamaged in the blast and after some quick repair work, I was back at it. Everything I'm doing right now is to finish the sandstone half slabs for the floor of the pyramid. 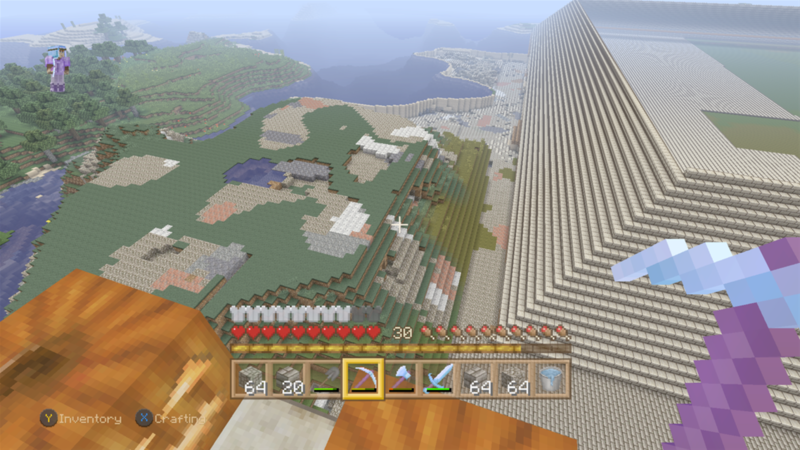 Seriously it is taking a ton of sand and sandstone to get this done. I started the floor a year ago and I'm not even halfway done. Never give up, never surrender! In my neck of the woods, both in the real world and in Minecraft, summer is here and it's getting hot. It's so hot that even digital animals need to cool themselves down.